I've had the great pleasure of enjoying 3 of these magnificent cask strength beauties in the last year or so and thought it well overdue to pay homage to this stunner. This was a plucky dip by the expert at Royal Mile who's only brief was 'likes peat and loves Octomore'. I was overexcited and totally captivated as the first bottle dwindled and far too engaged to take notes. Happily the same thing happened the second time around so I had to really focus to get pen and taste buds to collaborate as number 3 began to disappear. I've tried 5 Octomores and always get a special tingle, similarly with Uigeadail and a couple of the big Laphroiags. This does the same and the smile lasts for the entire evening long after the cork has been reluctantly replaced. The nose reminded me of roasted raw sugar, burnt toffee and over ripe apricots doused in good Brandy. Then the massive V8 burn out on a hot day with rubber left smouldering in a beach side car park. Unusual comparison but just seems to fit with the flavour. The mouth booms oldish oranges and mandarins mixed with botrytis. There's a bomb blast of caramel and dark wood ash that hits mid way and then a rich warm afterglow that lingers like a big cigar. If you're a fan of big rich smokey whisky this will make you very happy. 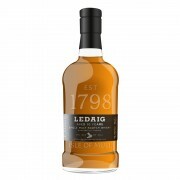 Ledaig can be fantastic at times can't it! I tried a lovely independent 17 year old Ledaig at Christmas at 66% Abv. Fantastic stuff!